That’s a glacial feature - a moraine - the most pronounced one in Essex County. It was created during the Ice Age when two sheets of ice crashed up against one another. That “bench” even has different below surface material, like gravel, compared to the surrounding soil. 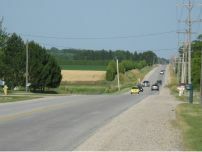 Driving towards Leamington motorists can also look south towards Lake Erie and see a sweeping vista, which simply marks “a remnant beach from that glacial lake,” Child said. Just east of Meloche Rd. is a well defined if shallow valley, very noticeable as one drives east on Pike Rd. from the urban part of the town. Child said that’s a longstanding tributary to the town’s Big Creek, which flows into Lake Erie. You wouldn’t know to see it now but at one time there was a “huge amount” of water in that channel, Child said. At one time Big Creek altogether was a vaster waterway than at present. That’s because it made up part of the southern portion of the Detroit River. Child said that as recently as within the past century, the Detroit River had several tributaries running into Lake Erie and did not have the clearly defined shoreline it has today. He compared the river to the way the present day St. Clair River flows into Lake St. Clair, creating several islands. “There were a number of shallow islands at the outlet of the Detroit River and the river itself would have flowed around these islands,” he said. For example, there used to be a channel where the current Amherstburg Coast Guard base is. The Detroit River shoreline all the way to Windsor was also much less defined than it is now. “At one time most of the Detroit River including downtown Windsor was all a large expansive coastal march,” Child said. Agriculture and settlement resulted in the damming up or infilling of those waterways. “There’s been a lot of infilling, placement of soil and other material, into those wetlands, to take it up to its current shoreline location,” the ERCA official said.